Here is your chance to find out. “The Law of Attraction Made Easy” will show you the basics of the law of attraction. If youre new to this term, the law of attraction simply says that like things attract each other. For example, positive thoughts attract positive outcomes in your life. Its not quite as simple as that, but in general the principles behind the law of attraction have worked countless times down through the centuries, and they can work for you. I challenge you to lay aside your skepticism and consider the principles that are discussed in “The Law of Attraction Made Easy.” If youre not getting the results that you want from life, then you owe it to yourself to put into practice these universal laws which are working for people all around the world. These are people just like you and me, except they have learned the laws of success in their personal and business lives. Its not luck or magic. It’s the application of solid principles and the commitment to do whatever it takes. Why not get started today? 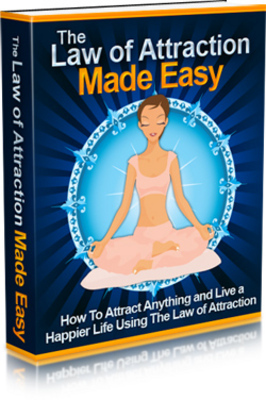 New Law of Attraction Made Easy law of attraction 161522266 9.95 kgscates Fresh Download Available!